I have made a number of films that have taken me around the globe to witness stark realities, injustice, hope, and to meet inspiring change-makers. I’ve focused primarily on human rights issues, and the environment. Making The Ghosts In Our Machine has profoundly tweaked my moral compass – differently. The Ghosts In Our Machine is a journey of discovery into what is a complex social dilemma. 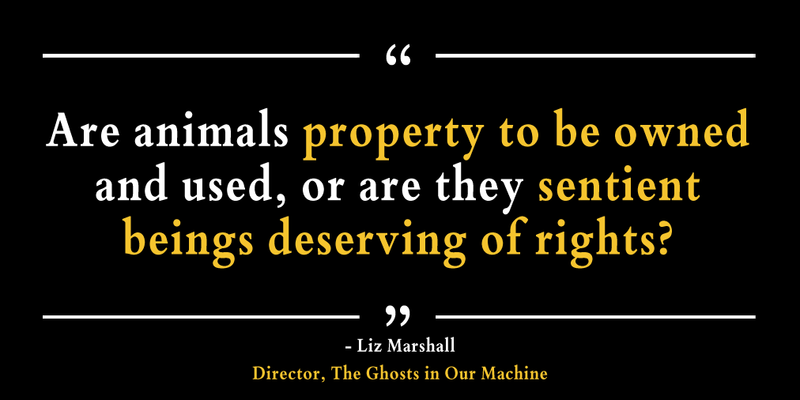 In essence, humans have cleverly categorized non-human animals into three parts: domesticated pets, wildlife, and the ones we don’t like to think about: the ghosts in our machine. Why do we value wildlife and our companion animals but not the billions of animals bred and used annually by global industries? It is this core question that prompted me to delve deeply to explore this subject matter. The film follows animal rights photojournalist Jo-Anne McArthur over the course of a year in parts of Europe, the USA, and in Canada. I chose to feature Jo-Anne as the film’s protagonist because her mission is an inspiring and sympathetic entry-point into the animal issue, and her powerful photographs invite us to consider non-human animals as individuals. As a filmmaker my heart is fully engaged, yet I am critically removed, looking through glass, examining the angles, the light, and the meaning of the greater story. My deepest motivation is to create an eye-opening experience for audiences, to remove people’s blinders, and to celebrate underrepresented narratives. Through story, sound and picture I hope people will see animals differently – forever. As consumers we can each make a difference for the ghosts, everyday.